The emergence and convergence of new technologies such as biotechnologies, information, educational or renewable energy technologies allow to enhance the efficiency and productivity growth, open up new business opportunities and lead to faster and more socially inclusive growth. They are therefore an important strategic element in defining the future of Poland and the whole European Union in the twenty-first century. The significance of the emerging technologies for social and economic development has been recognized especially since rapid advances in information and communication technologies (ICT). Since then, they continue spreading revolutionary power to modernize economies, societies and generate growth around the world. Yet, the ability of regions, communities and individuals to take advantage of these technologies depends on their absorptive, transfer and diffusion capac ities to turn them into socio-economic benefits. 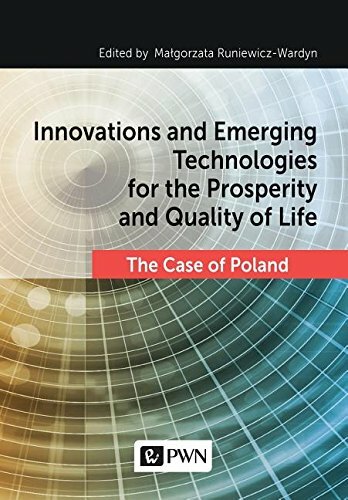 The following study discusses, first, the role of emerging technologies and innovations in modernizing, improving economic prosperity and enhancing quality of life in Poland and the EU, and secondly, point to the major present and future challenges related to these technologies on national, regional and individual levels. The authors of the individual chapters are experts in various fields (science and engineering, research and education, business and public administration), examining the importance of innovation and emerging technologies to economic growth and quality of life in Poland and the EU.